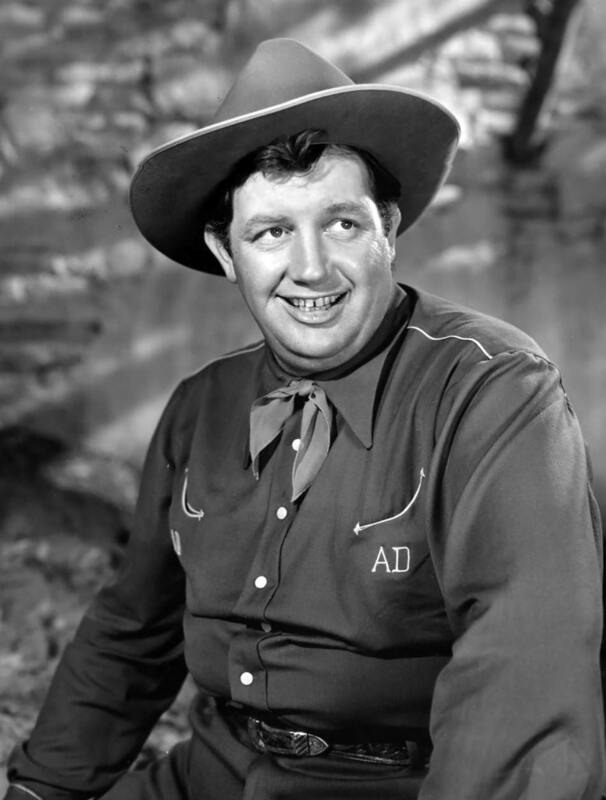 "Andy Devine Hosting AFRS Melody Roundup 407"
Everyone dreams of the glamor and glory of becoming a Hollywood leading man, but it seems that a Star’s career is filled with scandal and worry, that the glamor is temporary and the stress of staying on top can drive the best into an early grave. Character actors, on the other hand, tend to have careers which stretch into decades, and they always seem to show up for work with a smile on their face. Sure, they may be the clown or the sidekick, and they usually won’t get the girl at the end of the picture, but when shooting for the day ends and it is time to go home, the character actor probably has a pretty girl to go home to. 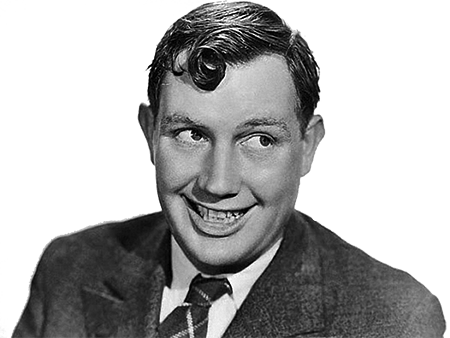 For your consideration, we give you Andy Devine. Andy was born in Flagstaff, Arizona, in 1905, and grew up in Kingman, where his parents ran the Beale Hotel. He was a rambunctious youth who eventually channeled his energy into football, and he would become a star player at St Mary & St Benedict College, Northern Arizona State Teacher’s College and Santa Clara University. After graduating, he went to find his fortune in Hollywood. The athletic young man (he was also working as a lifeguard at Venice Beach) found a number of bit parts in silent films, but before he could make a name for himself, talkies became the rage. It seemed as though Andy’s career was doomed; a childhood accident had damaged his vocal cords so that he sounded like “a steam calliope with a broken key”. Fate is a funny thing, and the high, squeaky voice with a timorous catch which should have sunk Andy’s career became his trademark. Starting out in college “Rah-Rah” films, the studios soon began giving Devine regular work as a sidekick in Westerns. He replaced Gabby Hayes as Roy Roger’s sidekick, playing Cookie Bullfincher in ten of Roy’s Technicolor features. Andy would be second only to the great Walter Brennan in the number of A-grade Western Sidekick roles, with more than 400 films to his credit. He was in the first films to star Hollywood greats like Henry Fonda, James Stewart and John Wayne (The Farmer Takes a Wife (1935) with Fonda, Small Town Girl (1936) with Stewart and Stagecoach (1939) with Wayne). Best known for his comic Western roles, Devine found a great variety of work. He donned tights to appear in George Cukor’s Romeo and Juliet (1936) with John Barrymore and Basil Rathbone, and Jack Webb had him play a police detective in the movie version of Pete Kelly’s Blues (1955). Many character actors had a distinguishing face or mannerism which gave them instant recognition on the screen. Andy Devine’s voice did the same thing on radio. Jack Benny used this to great effect in his long running series of “Buck Benny” sketches. 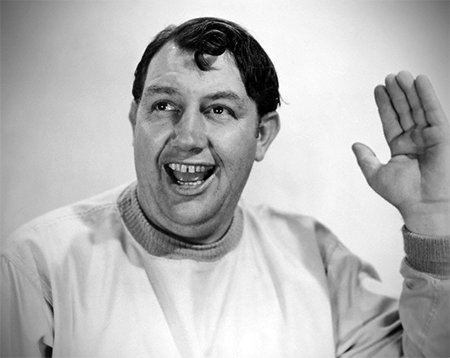 In fact, Devine with his trademark “Hiya Buck” greeting made more than 75 appearances on Benny’s program. He hosted AFRS Melody Round Up and supported the War Effort by appearing on Command Performance and G.I. Journal. One of his best remembered roles was as Deputy Jingles Jones on radio and TV’s Wild Bill Hickok from 1951 to 1958 (“Wait for me Wild Bill!”). Will Rogers introduced Andy to Dorothy House on the set of Doctor Bull in 1933, and despite Rogers’ teasing him about robbing the cradle (Andy was 29, Dorothy 19), the couple remained married for 44 years. The Devine’s avoided the hubbub of Hollywood by settling in nearby Van Nuys (Jack Benny joked that Andy was the ‘Mayor of Van Nuys’, and the town symbolically elected him as honorary Mayor). In his scratchy voice \" I just want to tell y\'all that is pretty stinky if I was still around these parts \"